Shooting several images and stitching them together has several benefits other than just getting a really wide picture. The first benefit is that you vastly increase the megapixel count of your camera. While I find that my 12.1 mp camera has more than enough pixels for most uses, the above image turned out to be 36.2 mp. This is highly advantageous if I ever want to print the panorama at a very large size (let’s say one measured in feet, not inches or centimeters). Another HUGE advantage of shooting a panorama and stitching in together in Photoshop is that the software automatically adjusts the perspective and removes any lens distortions. Have a look below if you don’t understand what I mean. That image was shot with a 16mm lens at almost the same time. Not only is it not as “wide angle” as the pano, but the distortion is just horrible. See how the buildings look like they’re falling backwards? It can be fixed in Photoshop, but it will end up highly cropped, with a very low megapixel count. Most point and shoot cameras have a setting for for shooting panoramas. You can take one picture, move the camera to the left or right, and the camera’s screen will help you line up the next one. If you’re shooting with a DSLR, the process is a little more difficult. First, turn off all the automatic settings. Set to Manual Exposure, Manual ISO and Manual White Balance. If the scene is unevenly lit (Like the Taipei pano) take a reading of the brightest area and use it for every one of the frames. If you change exposures as you pan, the final image won’t look even. Then you need to decide what you want the final pano to look like. Do you want a very long one like the image below? 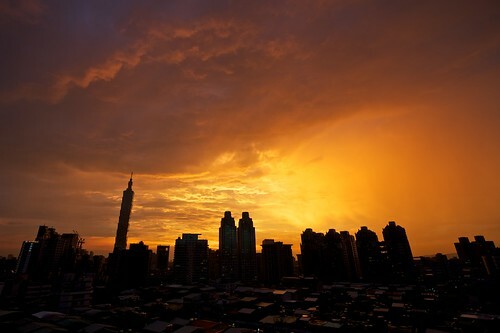 Or do you want it to look like a more traditional photograph like the one of Taipei, at the top? This is decided by how many photos you take and how you hold the camera: horizontally (sometimes called landscape orientation) or vertically (sometimes called portrait orientation). Yes, you can hold the camera vertically and shoot a panorama! This panorama of Litang, Tibet was stitched together with photos shot in the horizontal orientation. Then, start shooting your panorama! You should start on either the left side or the right side and be sure to leave LOTS of overlap between frames. I try to overlap by 1/3 to 1/2 of the frame. That means that the buildings that were on the left side of the first frame should still be in the second frame, only now on the right side. Have a look at the image below. See how some of the buildings are in three of the frames? Yours should look like that. The six photos before they were stitched together. Shoot much, much wider, higher and lower than you think you want. The software that stitches the final image together will bend and twist your images in strange ways and leaving lots extra at the top, bottom and sides will leave you more room to crop in the end. When you’re panning, try not to move the camera too much. Try to keep it in the same place and just rotate it. Using a tripod will really help you with this, but I find it’s not always necessary. If it’s a windy day and there some bushes or trees in the foreground, you’re SOL. Forget it, it’s not going to work. Try to reframe the image without the blowing plants in the foreground. If there are people walking around in the frame, just be mindful of them. Your final image will look a bit strange if the exact same guy is walking through your final image 8 times. Two solutions are to shoot real fast before they move much, or to clone them out of the final image. There is lots and lots of software out there that will stitch the photos together for you. Your camera probably came with some free software that will do an adequate job. But if you want all the distortion and perspective control, you should use Photoshop. CS4 has very a good automation and it gives you many options for how the final image will look. Go to Automate>Photomerge. It then gives you six different ways to stitch the frames together. I usually use “Auto” and it does a fantastic job. This is the one you want to use if you want the program to automatically remove all the distortion. After it’s processed, click Layers>Flatten Image, crop it however you like, and you’re finished! Thank you for these advices, it’s always good to remember what to do and what not when shooting this kind of images. Thanks Pierre! The highest resolution I have on the net is found here. Thanks for the link to other software that can do this! Thank you for the link to a higher resolution! Too bad it’s still not big enough to fill my screen (1280×800 on my laptop). Question: if you use the 16mm shot and a tool to “bend” the image properly to make the architecture look straight, would it dramatically reduce the quality and/or the resolution? Could it be used to, let say, print on a A4 or A3 document? When you use this method or the “perspective” method to straighten buildings, PS automatically interpolates the images where it needs to to keep the pixel length the same. The file size might change slightly, but not too much. The final size that you can print the image depends on how big the image was in the first place. Any DSLR or modern point and shoot should have no problem printing at A4, and if the native pixel width isn’t enough for an A3, PS also does an excellent job at interpolating. Just click on Image> Image Size… and type in the size and resolution that you want. 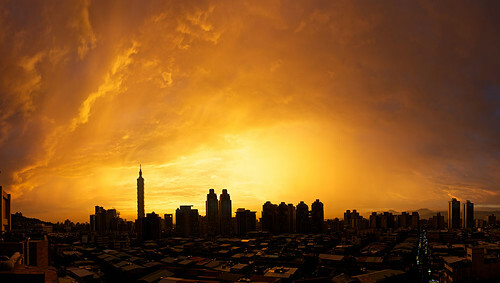 nice job on the exposure for the panorama, I like the underexposure of the city to bring out the vibrance of the sunset. I’ve been inspired by your images so much. Though I cannot afford a good camera, I’m learning the spirit of photography by using a digital one. I hope one day I can shoot some beautiful scenes in Taiwan too! Really nice work! Thank you so much for this post. The image is absolutely gorgeous, and I’ve never thought to try to stitch the images together like that. I can’t wait to try this! It really is easy to do. A lot of my friends and have been doing this all the time lately. Cool… where did you take this picture from? I shot this one from the roof of my building. You could shoot a similar from the top of Elephant Mountain. 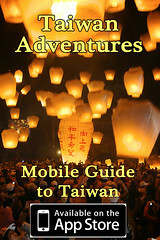 really nice pictures, i wish i could visit Taiwan someday.